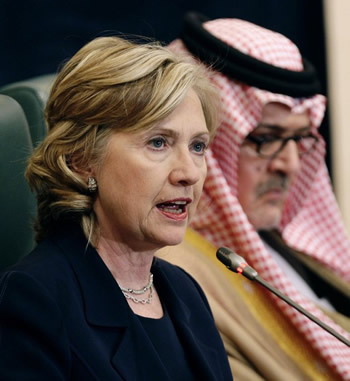 As Secretary of State, Hillary Clinton waived restrictions on selling weapons to governments that "donated" heavily to her family foundation, making it her personal mission to ensure that $29 billion worth of fighter jets were sold to Saudi Arabia. In the years prior to her becoming Secretary of State, Saudi Arabia had given the Clinton Foundation at least $10 million. Those jets have been used by Saudi Arabia, with the assistance of the U.S. military, to kill many civilians in Yemen. 28119 5 months ago John Westbrook Cortland, NY , US GIVE THE MONEY BACK NOW. 28116 1 year ago Christo Meyer Santa Cruz, CA , US The people of Yemen are not our enemies. Why do you choose to accept proceeds from their killers? 28107 2.6 years ago Lester Kober Quinton, NJ , US Give the graft back you hideous warmongering hag! 28105 2.6 years ago Stephen Brackens Brinkley San Diego, CA , US The people and especially, the children, deserve and desperately need this. The house of Saud does not.